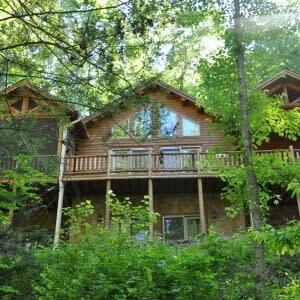 Serenity Falls Retreat is a secluded cabin in the mountains with year-round waterfall views! Enjoy the sound of Serenity Falls rushing over the rocks as you relax in the hot tub. The home is surrounded by 200+ acres of private undeveloped land owned by others, lending to it’s “Serenity”, and is located less than 15 miles from Lake Lure Beach/Chimney Rock area. Life at Serenity Falls is relaxed and inviting, an awesome home to make great memories with family and friends. This getaway has it all. This professionally designed retreat has an open great room with vaulted ceilings, wood beams and stone fireplace. The great room features custom lighting, a flat screen television with Dish TV, DVD player, stereo, and many natural details to make you feel at home. The well-appointed galley kitchen provides the perfect combination for a night of great entertaining or a favorite meal with the family. Stainless steel appliances and a double oven are provided. Check out the copper sink and range hood! 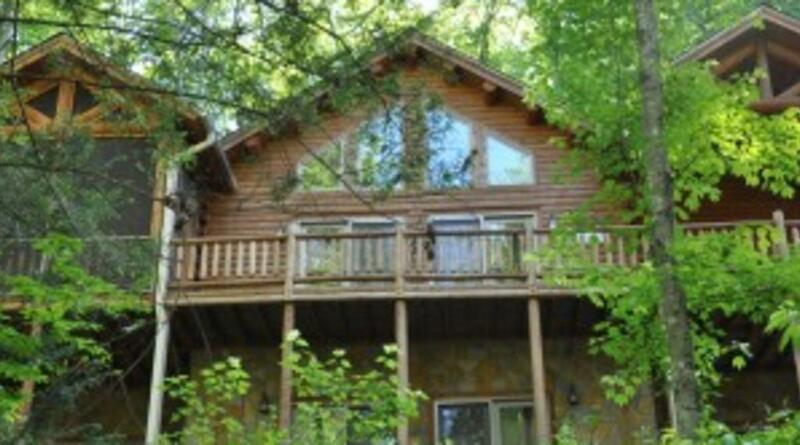 Additionally, it offers dining for eight, which opens onto the larger of two screened porches. A gas grill is located here for picnic grilling. For those who prefer some quiet time or like to make the most of a rainy day, choose a book from the library to read, play board games, or browse the wireless internet from any location you choose, or just relax in one of the screened in porch areas. This cabin boasts main level master suite, with king bed, and a claw foot tub facing Serenity Falls for a truly relaxing soak. A private screened porch is off the master for your enjoyment. A large walk in shower with double shower heads is just off the office. A printer is available for your use. If additional sleeping space is needed, the sofa in the loft area is also very comfortable. A flat screen TV serves DVD only. The lower level family room is spacious and comfortable. French doors lead to outdoors. There are 3 bedrooms off this area. Two provide queen beds and French doors leading outside. One of these bedrooms is connected to the full bath. A flat screen TV serves DVD only. There is also a bedroom with a double bed/twin bed combination bunk. A fitness area provides a treadmill, Lance Armstrong bike, and punching bag. But really, aren’t you on vacation? Also a full laundry room is provided. Outdoors, adjacent to the hot tub is the newly built playground area. Included are traditional swings, tire swing, climbing wall, swinging bridge, telescopes, binoculars, rope ladder, slide, and enclosed playhouse. This is truly awesome and will keep the little ones busy. Across from the entrance to Retreat at Cedar Creek is the little “rapids” of Cedar Creek. While that is private property, the owners have posted signs allowing people to enjoy it so long as they follow some very basic rules. It is certainly a fun filled attraction for the family! After the day’s activities, take in a nightcap or hot beverage in one of the screened porches and enjoy the calm evening surrounded by nature. Look for turkey, deer, and many birds on the grounds. Stargazing is awesome in the hot tub! Whatever you are looking for, you are sure to find it at Serenity Falls.